While in Norman recently, I decided I needed a snack. A cupcake sounded great so I went to Gigi’s Cupcakes, located at 1626 24th Avenue NW in Suite F-102. It’s easy to miss, so I’m glad I found the shop. Upon entering, I was greeted with a sincere hello, and I was encouraged to try samples of some new cupcakes that had recently been added to the menu. They had about 10 flavors of cupcakes to choose from as well as some holiday cupcakes, mini cupcakes and cheesecake. Gigi’s has a different menu every day of the week, but some cupcakes like Wedding Cake, Midnight Magic and White Midnight Magic are offered daily. Some other flavors they offer are: Carrot cake, Strawberry Shortcake, Scarlett’s Red Velvet, Peanut Butter Cup, Chocolate Chip Cookie Dough, Apple Pie and more. I picked up four cupcakes — one for each person in my family. I purchased White Midnight Magic, Midnight Magic, Bananas Foster and a holiday vanilla cupcake that looked like a snowman. I ate the White Midnight Magic — a chocolate cake with cream cheese icing and mini chocolate chips on the top. The cake was a little dry, but I went later in the day so that is a bit understandable. However, the icing is to die for. I could not get enough of it. I tasted the other cupcakes and they were great. All of them were gone right after dinner because we couldn’t wait to eat them. 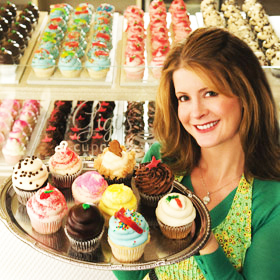 One thing that sets Gigi’s apart from other cupcakeries (bakeries selling only cupcakes) is their cake-to-icing ratio, because Gigi’s always has much more icing than needed for the cupcake. Some people complain about too much icing but I would never do such a thing because I’m an icing fanatic. If you are looking for an after-dinner treat, something to satisfy your sweet tooth or even a snack, Gigi’s is the perfect place to go.